Families across the UK are being forced to cut spending on essential items such as food, clothing and heating as a result of government cuts to child benefits, a new report has found. Low-earners are among the hardest hit, the research suggests. The campaign consists of a coalition of more than 150 child welfare organizations, social justice groups, faith groups and trade unions. Following the release of its report, the campaign called on the government to protect child benefit payments in the same way as state pensions. The typical working family with two children will lose £513 this year due to welfare changes made in the last parliament, the report said. Across the country, more than 4 million households have been affected by below-inflation rises to child benefits and child tax credits, it added. As part of its research, End Child Poverty surveyed 1,000 families to discern how many have had to make household budget cuts as a result of benefits cuts. A third of those polled said they had cut back on family trips and outings, 26 percent said they had spent less on clothes, 20 percent had cut down on food, and a further fifth had cut back on heating. Among families earning less than £15,000 a year, 40 percent said they were forced to spend less on food, while 45 percent said they were spending less on heating. 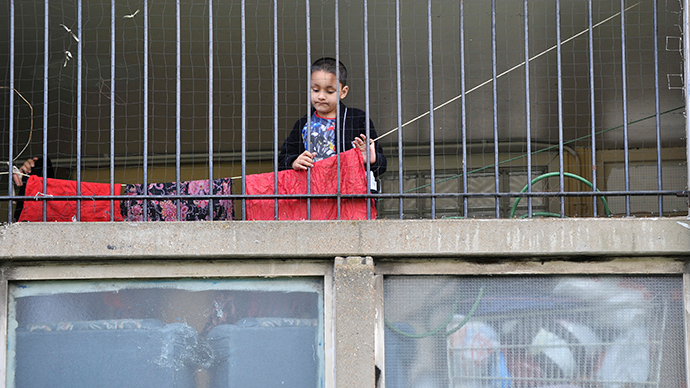 End Child Poverty has called on the government to “triple lock” guarantee child benefit payments. The triple lock was introduced by the coalition in 2010 as a guarantee that state pensions would rise every year by the highest of the following economic factors: rate of inflation, increase in average earnings, or a minimum of 2.5 percent. It was meant to prevent social benefits from being eroded by economic fluctuations. The coalition government provided this protection to state pensions in a bid to reduce pensioner poverty and the Tories have pledged to continue the policy. “It is deeply worrying that parents are having to cut back on food, heating and other essentials that their children need in order to develop and thrive,” Chairman of End Child Poverty David Holmes said. “The new Government needs to seize the opportunity in the Queen’s Speech to stop the rise in child poverty. During the election campaign David Cameron promised not to cut Child Benefit, now is the time for him to keep that pledge,” he added. A Treasury spokesperson said the percentage of people in relative poverty in the UK is at its lowest level since the mid-1980. “The only sustainable way to raise living standards is to keep working through the government’s long-term plan that is building a resilient economy with more people in work than ever before and has enabled us to announce the first real-terms increase in the minimum wage since the great recession,” the spokesperson said.